Ytx14-bs / hjtx14 (l) fp-s. L 150mm w 85mm h 100mm. 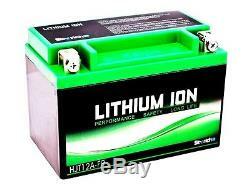 12 v - 12 ah. Warning: do not load when receiving the battery, it is already 80% pre-charged. Equivalence: ytx14-bs width: 150 mm depth: 87 mm height: 145 mm voltage: 12v capacity: 12 pcb cc: 210 std load: 4.5 max load: 35.0 weight: 0.99 kg terminal: + left. The latest generation of motorcycle lithium battery (li-ion). The brand electhium / electhium presents lithium batteries with weight gain and increased power. Technical advantage: 3 times lighter than a conventional lead battery. Quick charge in 6 minutes. Longer life, double compared to a normal battery. Perfect performance even at high temperatures. High protection because it is non-explosive and non-combustible. This battery does not require a special charger because a car or motorcycle battery charger is enough. This type of battery is used in competition for non-negligible weight gain. Features: only 1/3 of the weight of your original battery theoretical life 15 times longer than lead batteries no possible leak because no acid in the battery no lead, no cadmium, no mercury: less polluting product 4 times colder than lead batteries is practically unloaded technically, lithium technology surpasses lead / acid technology in every respect: safety, cleanliness, performance. The biggest change in battery since the advent of maintenance-free batteries - this battery is not based on lead or other heavy metals, it is lithium-based. It is identical in size to your original battery. Etv 1000 caponord, 2001 - 2007. Na 850 mana, 2007 - 2011. Na 850 mana gt, 2009 - 2012. Rsv 1000 thousand r, sl, sp, 1998 - 2000. Sl 1000 falco, 2000 - 2005. Sl 750 shiver, 2007 - 2012. Sl 750 shiver gt, 2009 - 2012. Smv 1200 dorsoduro, 2011 - 2012. Smv 750 dorsoduro, 2008 - 2012. Smv 750 dorsoduro factory, 2010 - 2012. Sr max 125 th, 2011 - 2011. Srv 850, 2012 - 2012. Adiva 125, 2000 - 2003. Adiva 150, 2001 - 2003. F 650 gs twin-cylinder, 2010 - 2010. F 650 gs twin cylinder, 2011 - 2012. F 800 gs trail, 2008 - 2012. F 800 r roadster, 2009 - 2012. F 800 s / st road, 2006 - 2012. Hp2 1200 enduro, 2006 - 2009. Hp2 1200 megamoto, 2007 - 2010. Hp2 1200 sport, 2008 - 2011. K 1200 r (abs), 2005 - 2008. K 1200 s (abs), 2005 - 2008. K 1300 r, 2009 - 2012. K 1300 s, 2009 - 2012. R 1200 gs (abs), 2004 - 2009. R 1200 gs (abs), 2010 - 2012. R 1200 gs baton adventure, 2007 - 2012. R 1200 gs rally, 2012 - 2012. R 1200 s, 2006 - 2009. R 1200 st (abs), 2006 - 2008. S1 1200 ligh ting, 1997 - 1999. Xb-12r firebolt, 2004 - 2007. Xb-12r firebolt, 2008 - 2008. Xb-12s lightning, 2004 - 2008. Xb-12s lightning, 2009 - 2010. Xb-9r firebolt, 2002 - 2007 Xb-9s lightning, 2002 - 2007. Xb-9sx city x, 2005 - 2010. Canyon 500, 1999 - 2001. Canyon 600, 1996 - 1999. River 500, 2000 - 2000. Fuoco 500 ie, 2007 - 2012. Xl 1200 l sportster low, 2007 - 2011. Xl 1200 x forty eight, 2010 - 2012. Xl 883 r roadster, 2010 - 2010. Gl 1500 fcc valkyrie sc34, 1997 - 2002. St 1100 pan european sc26, 1989 - 1989. St 1100 pan european sc 26, 1990 - 1991. St 1100 pan european sc26 abs, 1992 - 1995. St 1100 pan european sc26 without abs, 1992 - 1995. St 1100 pan european sc26 abs-tcs, 1996 - 1996. St 1100 pan european sc26 without abs, 1996 - 1996. St 1100 pan european sc26 abs-tcs, 1997 - 2002. St 1100 pan european sc26 without abs, 1997 - 2002. Trx 300 fw fourtrax, 1988 - 2000. Trx 350 es rancher 4x4, 2000 - 2012 Trx 400 f ranch at, 2004 - 2007. Trx 400 fw foreman 4x4 , Trx 420 fe rancher at, 2008 - 2012. Trx 420 fe rancher 4x4, 2007 - 2012. Trx 450 e / fe fourtrax, 1998 - 2004. Trx 500 foreman 4x4, 2001 - 2004. Trx 500 foreman rubicon 4x4, 2005 - 2012. Trx 500 fe foreman 4x4 es, 2005 - 2012. Vt 750 c shadow rc44, 1997 - 2003. Vtx 1300s retro sc52, 2003 - 2008. Xl 1000 v varadero sd01 sd02, 1999 - 2002. Xrv 750 africa twin rd07, 1993 - 1995. Xrv 750 africa twin rd07, 1996 - 2003. Sms 610 super biker, 2002 - 2010. Sms 610 supermoto, 2005 - 2010. Te 410 enduro, 2000 - 2001. Te 610 enduro, 1999 - 2001. Te 610 th enduro, 2002 - 2005. Te 610 th enduro, 2006 - 2007. Gt 125 comet, 2004 - 2012. Gt 125 th comet racing, 2006 - 2012. Gt 250 comet, 2004 - 2007. Gt 250 r comet racing, 2006 - 2007. Gt 650, 2007 - 2008. Gt 650, 2009 - 2011. Gt 650, 2012 - 2012. Gt 650 comet r / s, 2004 - 2006. Gt 650 r sporty, 2007 - 2008. Gt 650 r sports, 2009 - 2012. Gv 650 aquila custom, 2004 - 2005. Gv 650 aquila custom, 2006 - 2012. St7 custom, 2010 - 2012. Gtr 1400 caf-cbf-ccf, 2010 - 2012. Gtr 1400 zg a8f-a9f, 2008 - 2009. Kfx 700 v-force, 2004 - 2011. Klv 1000, 2004 - 2006. Kvf 650 meadow 2x4 4x4, 2002 - 2009. Kvf 750 eps, 2012 - 2012. Kvf 750 gross force 4x4, 2005 - 2009. Vn 800 a1 a2, 1995 - 1996. Vn 800 a3 a4, 1997 - 1999. Vn 800 classic b1-b6, 1996 - 2001. Vn 800 classic b7-b10, 2002 - 2005. Vn 800 drifter c1 c2 e1, 1999 - 2001. Vn 800 drifter e2-e3, 2002 - 2003. W 650 ej a1 / c1-c6, 1999 - 2004. Zrx 1100 c1-c4 d1, 1997 - 2000. Zrx 1200 r / s a1-a6 / b1-b6, 2001 - 2006. Zx 1100 gpz e e1 e2 f1 abs, 1995 - 1998. Zx-12 r ninja a1, 2000 - 2000. Zx-12 r ninja a2, 2001 - 2001. Zx-12 r ninja b1-b2, 2002 - 2003. Zx-12 r ninja b3 b5, 2004 - 2006. Zzr 1100 zx-11 d1, 1993 - 1993. Zzr 1100 zx-11 d2, 1994 - 1994. Zzr 1100 zx-11 d3-d9, 1995 - 2001. Zzr 1200s c1-c4, 2002 - 2005. Zzr 1400 zx / abs a6f-a7f / b6f-d9f, 2006 - 2007. Zzr 1400 zx / abs d8f , 2008 - 2011. Zzr 1400 zx / abs, 2012 - 2012. Myroad 700 i, 2011 - 2012. Xciting 500, 2005 - 2008. Xciting 500 ir, 2009 - 2012. Puma 250 jianshe, 2003 - 2005. Mp3 125, 2006 - 2010. Mp3 125, 2011 - 2011. Mp3 300 light hybrid, 2011 - 20 12. Mp3 300 lt, 2010 - 2012. Mp3 yourban 125, 2011 - 2012. An 650 burgman k3-k5, 2003 - 2005. An 650 burgman k6-k7-k8-k9-l0, 2006 - 2010. An 650 burgman l1 , 2011 - 2011. An 650 burgman l2, 2012 - 2012. Dl 1000 v-stroma k2-k9, 2002 - 2009. Dr 650 rse sp43a, 1991 - 1996. 800 sr43a, 1994 - 1994. 800 sr43a, 1995 - 1995. Dr 800 s sr43a, 1996 - 1996. Dr 800 s big sr42a, 1991 - 1993. Gsx 1100 g gv74a, 1991 - 1993. Gsx 1400 k1-k7, 2001 - 2007. Lt-a 400 eiger 4x4, 2002 - 2007. Lt-a 400f kingquad 4x4 auto k8-k9-l0, 2008 - 2010. Lt-a 400f kingquad 4x4 auto l1-l2, 2011 - 2012. Lt-a 450x kingquad - 4x4 k7-k8- k9-l0-l1-l2, 2007 - 2012. Lt-f 400 kingquad - 4x2 k8-k9-l0, 2008 - 2010. Lt-v 700 f twin peaks, 2004 - 2005. Sv 1000 n k3-k6-k7, 2003 - 2007. Sv 1000s k3-k6-k7, 2003 - 2007. Blade 250 4x2, 2006 - 2011. Blade 325 4x2, 2007 - 2012. Target 325 4x2, 2008 - 2012. Daytona 955i double t525, 2001 - 2001. Daytona 955i double t525, 2002 - 2004. Daytona 955i mono t507, 1999 - 2000. Daytona 955i single t507, 2001 - 2001. Daytona 955i single t521 centenary, 2002 - 2002. Speed ​​triple 955 and t509, 1999 - 2001. Speed ​​triple 955 and t509, 2002 - 2005. Sprint 955 i rs t625 , 2000 - 2002. Sprint 955 i rs t625, 2003 - 2005. Sprint 955 i st t620, 2000 - 2005. Tiger 900 t709, 1999 - 2001. Tiger 955 i t720, 2001 - 2004. Tiger 955 i t730, 2005 - 2006 Trophy 1200 t345, 1999 - 2003. Trophy 900 t336, 1998 - 2001. Fj 1200 abs 3ya, 1991 - 1992. Fj 1200 abs 3ya, 1993 - 1994. Fzr 1000 exup 3le, 1991 - 1991. Fzr 1000 exup 3le, 1992 - 1993. Fzr 1000 exup 3lf, 1994 - 1994. Fzr 1000 exup 3lf, 1995 - 1995. Gts 1000 abs 4bh, 1993 - 1996. Gts 1000 abs 4bh, 1997 - 2000. Xj 900s diversion 4km, 1995 - 2003. Xjr 1200 4pu, 1995 - 1996. Xjr 1200 4pu, 1997 - 1998. Yfm 660 r raptor 5lp, 2001 - 2005. Yzf 1000 r thunder ace 4vd, 1996 - 2001. Delivery time: 5 to 15 working days !! choose the delivery method before paying! Important: we offer for some small items, envelopes bubble envelope stamped in letter. This mode of sending is very economical but does not provide. No guaranteed time, no tracking. Thank you for taking note of it and not to hesitate, for 1 or 2 euros more, to choose a sending followed letter followed, relay point or. Important: in case of choice of global relay !! specified in your order your choice of relay point or contact us at 03.25.55.74.71. Relay point only in f. Continental rance not the islands, like Corsican etc. The processing time of your order can vary 4 to 15 working days, please contact us before the purchase !! other thousands of pieces with misterbike-fr. 03.25.55.74.71 / 06.62.69.50.19. Monday to Friday from 9h-12h to 14h-18h. The item "yamaha xj 900s diversion battery / xjr 1200 / yfm 660 r raptor" is sold since Wednesday, February 6, 2013. It belongs to the category "auto parts, motorcycle parts, accessories \ motorcycle parts, spare parts" ". The seller is "destocnet" and is located in / at bettancourt la ferée. This item can be shipped to the following countries: france, germany, belgium.